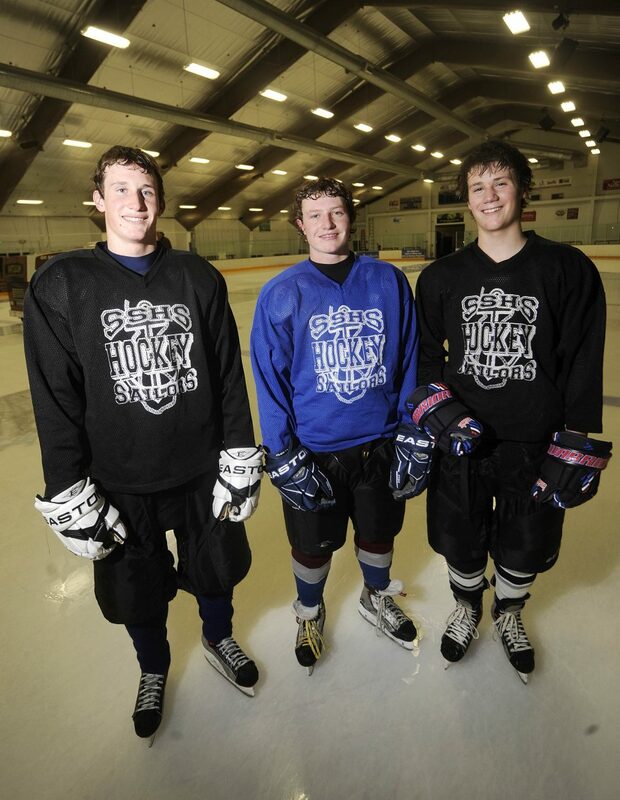 Steamboat Springs High School hockey team players, from left, CJ Walt, Michael Samuelson and Jarret Walt commute from Craig to play on Steamboat’s team. The three players have added size and depth to the roster. Steamboat Springs — In just about every sense, Steamboat Springs and Moffat County have as natural a rivalry as you’ll get. The 45 miles that separate the two schools on U.S. High­way 40 make the rivalry one of the best this side of Inter­state 70. But occasionally, that rivalry gets blurred. Bulldogs become Sailors. Sailors become Bulldogs. For Steamboat Springs High School hockey coach Jeff Ruff, the blurring of that rivalry may help his team reach heights it never has seen. Three Craig players — CJ and Jarret Walt and Michael Samuelson — have made the commute this season to help add size and depth to a 5-1 Steamboat team that is atop the Foothills Conference. For the three Craig players, changing from Bulldogs blue to Sailors red hasn’t been a big issue. The three had played in Steam­­boat with or against most of their current teammates. To maintain some allegiance to Moffat County, the three still continue to play on the Craig Midget team. But for now, the focus remains on the Steamboat season. The three come to town at least twice a week for practice, and more if there are games. To do this, each misses the last two periods of class. Although it can make for extra work in and out of the classroom, each said he’s happy about the decision. So is Ruff, who had been concerned about a lack of depth — especially on the defensive end. All three Craig athletes have played and contributed in all six games. Jarret Walt has an assist, Samuel­­son has a goal and an assist and CJ Walt has two assists, while helping anchor Steam­­boat’s power play unit. The three are also a physical presence in the lineup, which Steam­boat desperately has needed. CJ Walt has been especially impressive, pairing with Steamboat sophomore Christian Ramirez on defense to give the Sailors one of their top two defensive pairings. In the final game of the pre-holiday schedule, a 6-2 win against Peak to Peak, CJ Walt and Ramirez helped initiate two of three Steamboat power play goals. Although the two battled each other in fall on the football field, the performance on the ice suggests they work together well as teammates. But now, with the early part of the schedule finished and the most important games remaining, the three Craig transplants certainly will be asked to help a talented Steam­­boat team advance to the Final Four.